SUMMERSIDE, P.E.I. – Artist Nancy Cole was on a seven-week international residency in a remote and rural community dotted in the Serra da Estrela mountains of Portugal, when on her last night wildfires engulfed the area and killed more than 40 people. Nancy Cole captured a local Summerside fisherman. She calls the image ‘Vanishing Point’ about corporate farming taking over from small-scale fishermen. “It made all of these pieces more important to me because it was no longer just a nostalgic look at rural Portugal, but now I don’t know if those people survived,” she motioned to a particular image of an elderly widow with a warmness attached to her eyes. “This elderly widow was in a small village and was sitting on a dry stone wall wearing a traditional hat. She was lamenting that the village water at the top of the hill wasn’t good, but for her to carry the buckets back up to her home from the newer, better well was a weight too much for her to bear,” said Cole, who was in Portugal in Oct. 2017. “I did a whole series where I put 44 red French knots on each of the portraits because 44 people died that one night when the wildfires broke out in that area where we were staying,” she noted. Cole’s contemporary artwork is done on Tyvek, which is a brand of flash-spun high-density polyethylene fibers used to wrap homes in. 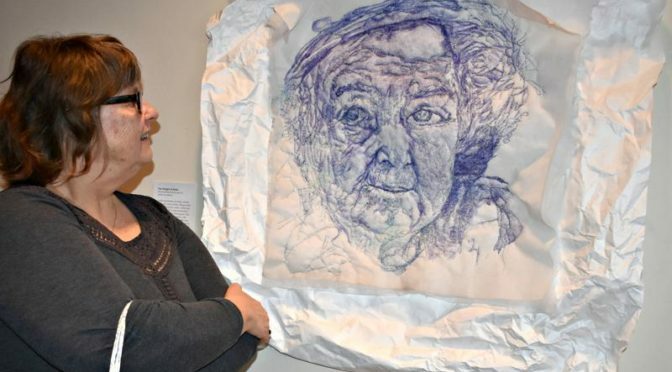 Every one of her pieces has a story behind the face that has been originally drawn by Bic pen while incorporating reflections of her journalism career, and then hand-quilted to the Tyvek. Daria Ross, from the left, and Meike Brown her mother Becka Viau’s artwork. Cole took with her to Portugal at a Bic pen and a sketchbook, capturing moments that will forever be treasured. “It’s being journalistic, but trying to do it visually,” she said as her eyes lit-up. As people weaved their way through the creative pieces, some stopped to speculate on Becka Viau’s creative display. The exhibition that opened on Sunday afternoon will continue until mid-February. 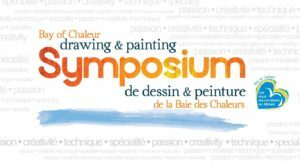 Nikki Gallant, the site director, said the exhibition would not be possible without the support of Innovation P.E.I. Culture Action Plan.